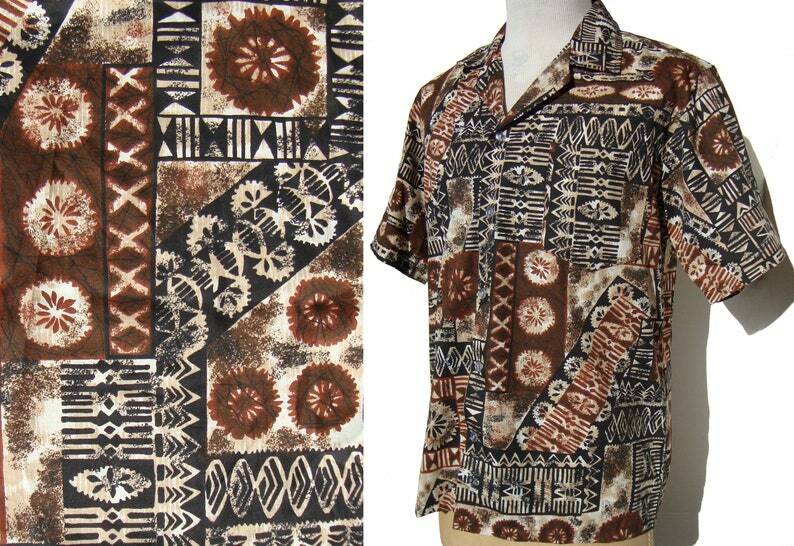 Warm earth tones and a barkcloth style Tiki print makes up this handsome vintage men’s Aloha shirt by “Meet Me in Maui”, circa 1980s. The vivid Polynesian surf shirt consists of a medium weight poly/cotton blend fabric with Hawaiian Tiki print in tones of coffee and maple brown, black, and cream. It has short sleeves, notched collar, button down placket, single patch pocket, and an embroidered label for “Meet Me in Maui” along with a fabric care label which includes “65% Polyester 35% Cotton”, “Made in Hawaii”, and a size of “M” although it fits more like a Large.